On 18 July 2017, representatives of the Donetsk and Lugansk People's Republics, as well as 19 regions of Ukraine, announced the creation of the Little Russia state. The constitutional act on the formation of a new state was read in Donetsk and. about. Deputy Chairman of the Council of Ministers DNP Alexander Timofeev. "We, representatives of the former regions of Ukraine, declare the establishment of a new state, which is the assignee of Ukraine. We agree that the new state will be called Little Russia, as the very name of Ukraine discredited itself," the constitutional act says. Earlier, the head of the People's Democratic Republic of Belarus, Alexander Zakharchenko, read to the audience the political declaration, which justified the need to create the state Little Russia. It is emphasized, in particular, that the creation of a new federal state is called upon "to stop the civil war and to avoid new victims." "The state" Ukraine "showed itself as a failed state and demonstrated the inability to provide its inhabitants with a peaceful and prosperous present and future," one of the points of the political declaration emphasizes. According to the Constitutional Act of Little Russia, Donetsk should become the capital of a new federal state with broad autonomy of regions, while Kiev will retain the status of a historical and cultural center. The flag of Little Russia will be the flag of Bogdan Khmelnitsky. Under Catherine the Great, in the late 18th Century Russia colonised the vast territories of Novorossiya [“New Russia”] along the coasts of the Black and Azov Seas. A new ethnic formation developed in the former Novorossiya, the settling of which began during the time of Catherine the Great. The Russian government was interested in settling and economically developing the steppe in the Northern areas bordering the Black Sea and the Sea of Azov (Novorossiya). It was precisely there that the settlers coming from Southern Bessarabia settled in the mid-19th Century. One did not have to be an ethnographer to see the extent to which the people themselves, their way of life and their perceptions were distinct from the population and the way of life of "classical" Ukraine, not to speak of Galicia. residents of Donetsk Oblast felt closer to Russians than to Ukrainians from all other oblasts of Ukraine. Residents of Luhansk Oblast felt exactly the same, with the only exception for their Donbass neighbors. 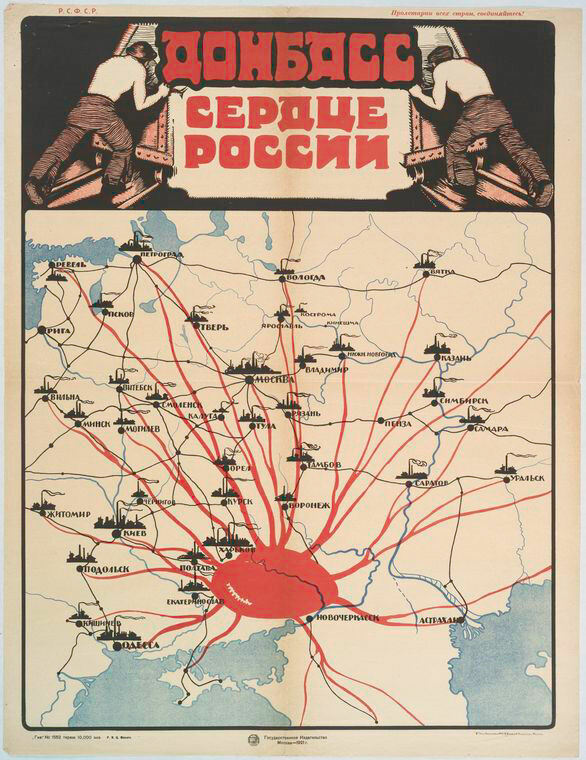 The Donets basin [the Donbass] of the Ukraine was one of four key coal mining regions in the USSR, along with the Kuzbass and Vorkuta of Russia, and Karaganda Basin of Kazakhstan. 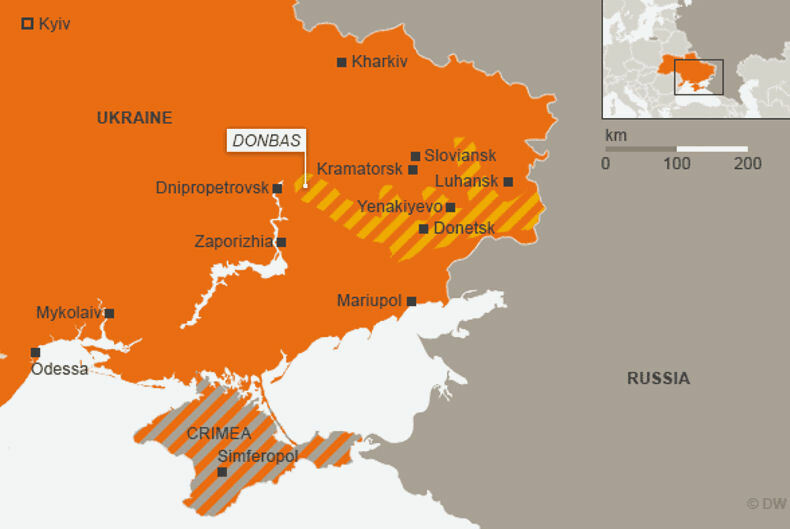 The Donbass Region is located in the southeastern corner of the Ukraine and the adjacent area of the Russian Republic. The Donbas is Ukraine's industrial heartland. But its coal-based economy is a heavily-subsidized millstone for independent Ukraine, not a powerhouse, no matter how important its arms exports might be to the Russian military. Coal reserves in Donbass amount to 55 billion metric tons, of which 34 billion are accessible. 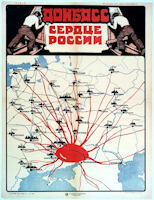 In 1987 Donbass accounted for about 26% of the coal produced in the Soviet Union. Coal production in the Donbass declined from 198 mmt in 1987 to 179 mmt in 1990. The area produces anthracite and coking and thermal bituminous coal from deep underground mines averaging 600 meters in depth with thin seams averaging 0.9 meters in thickness. Coal extraction in Donbass requires mining deeper, thiner seams thus increasing the temperature inworking areas and concentrations of both methane gas and water. These conditions require greater investment in mine ventilation systems, gas detection systems and gas protection equipment for miners. Given that coal extraction in the Donbass is becoming increasingly expensive and complicated, it was not clear how much investment in further development of mines in this area would be economically justified. Since the 1980s, it has been unprofitable, expensive and has really only been kept alive artificially for social reasons. 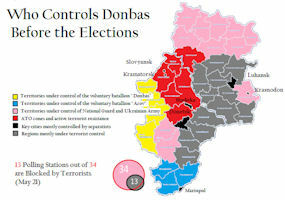 The Donbass had long been the scene of political unrest. In August and September 1962, people all over the Ukrainian Republic were talking at that time about unrest and "uprisings" in cities of Rostov-area, Donbass, in Kuban, and in some harbor-cities of Testern Georgia. Practically the whole Donbass area was swept by strikes. Miners refused to go down and organized sitting strikes. Party and militia tried their best to persuade people not to revolt and go back to work. They also promised extra-pay and rations. Then one night "the whole army" was transported to Donbass-cities from Siberia, to meet any emergency. "It looked as though during the war behind the front, everywhere soldiers and tanks". The atmosphere was very tense. Some party people lost completely their heads and did not know what to do until the army arrived. After uprisings and demonstartion, in all places, there were arrests of those most active participants. In August and September of 1962 there were rumors among the Ukrainians that they may have been "quietly liquidated" as in the old times. Gorbachev was able in July 1989 to deflect blame for the miners‘ strikes and turn, them to his own immediate advantage, but only by granting major concessions to the miners. 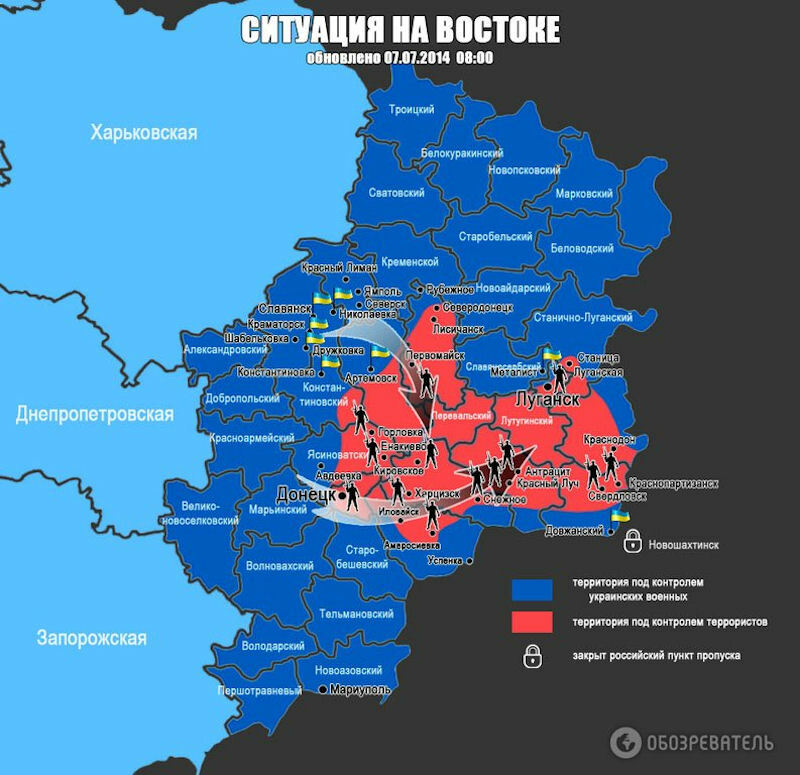 The strike committees in the Donbass virtually controlled the mining towns, meeting with no resistance from the local party structures. Heady from their success, organized miners spearheaded formation of a mass labor movement. In the Donbass mining region, by 1991 difficult economic conditions aggravated relations between Ukrainians and the large minority of Russians living there. Soon after Ukrainian indpendence, the economic difficulties together with other factors began to stimulate separatist tendencies in Ukraine, for example in the Crimea and in Novorossiya (Odessa, Nikolayev, and Kherson Oblasts). A Russian ethnic republic in Ukraine was named Novorossiya and was proclaimed in 1992 but fell some days after. Large protest were staged the Donbass in January 1996, when over 1 million coal miners in Russia and Ukraine went on strike to demand back wages of $200 million and $367 million, respectively. Together, Donetsk and Luhansk constitute 15 percent of Ukraine's population, or approximately 6.5 million people. 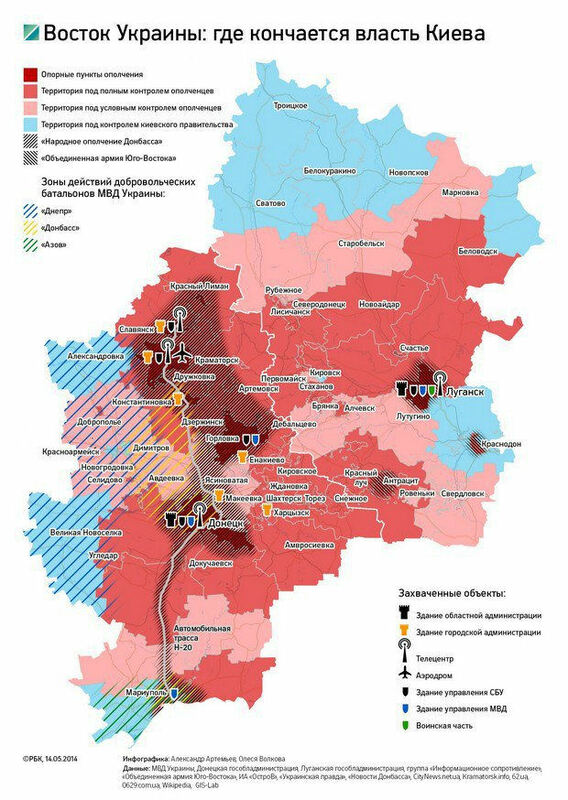 In the early 1990s, the majority of Communist Party support comes from the main industrial, metallurgical, and coal-mining oblasts Donetsk and Luhansk. That was really their bedrock. They did reasonably well in what used to be called Novorossiya: that is to say, what Russian’s call the southern Ukraine and the Odessa districts. Numerous companies in eastern Ukraine provide important raw materials and products to Russia - especially for the Russian space and defense industries. Russian intercontinental ballistic missiles, along with spare parts and maintenance, come from the eastern Ukrainian city of Dnipropetrovsk alone. In the Donbas, a special steel is produced for the tanks of the Russian armed forces, and most Russian combat helicopters fly with engines from Zaporizhia. But these areas have not been the scene of Moscow-inspired uprisings. Separatists in both Luhansk and Donetsk claimed massive support in their May 11 referenda. De facto election authorities in both regions claim overwhelming support for self-rule: 89 percent in Donetsk and roughly 96 percent in Luhansk. But since then, the temperature cooled, with Moscow refusing to openly endorse the results and Russian troops stepping back from the Ukrainian border. Ukraine's acting president, Oleksandr Turchynov, says turnout was 24 percent in Luhansk, 32 in Donetsk. Russian military intelligence [GRU] officers in Ukraine coordinated the unrest. Valery Kaurov is the self-described “president of Novorossiya” and called on Russian President Vladimir Putin to deploy troops to the territory described as Novorossiya. He supported separatist activities in Ukraine’s Donetsk and Lugansk territories. The Luhansk and Donetsk people’s republics declared themselves independent states following the May 11 referendum and soon started to form governments and law enforcement agencies. The self-proclaimed republics of Donetsk and Luhansk signed a treaty on 24 May 2014 to unify under the name of Novorossiya. Oleh Tsarev, a Ukrainian presidential candidate and an active pro-federalization supporter, announced 29 April 2014 he was withdrawing from the upcoming May 25 presidential election in the country. “I made a decision to withdraw from the election as I think the status of a candidate is not efficient under the current conditions. We will search for other information sources and ways to get our thoughts and messages across to the citizens of Central and Western Ukraine”. By July 2014 Tsarev was speaker of the unity parliament of Novorossiya, the union of the self-proclaimed Donetsk and Luhansk republics in eastern Ukraine. Defense analyst Pavel Felgenhauer, a columnist with Moscow's Novaya Gazeta newspaper, said in mid-June 2014 that Russian President Vladimir Putin was stepping up military pressure because Moscow cannot accept a collapse of the rebel movement in Ukraine's eastern Donbas region. Felgengauer says Russia is pushing a truce while supplying weapons to the rebels in order to keep the conflict going and therefore retain leverage over Kyiv and prevent the expansion of Western influence. 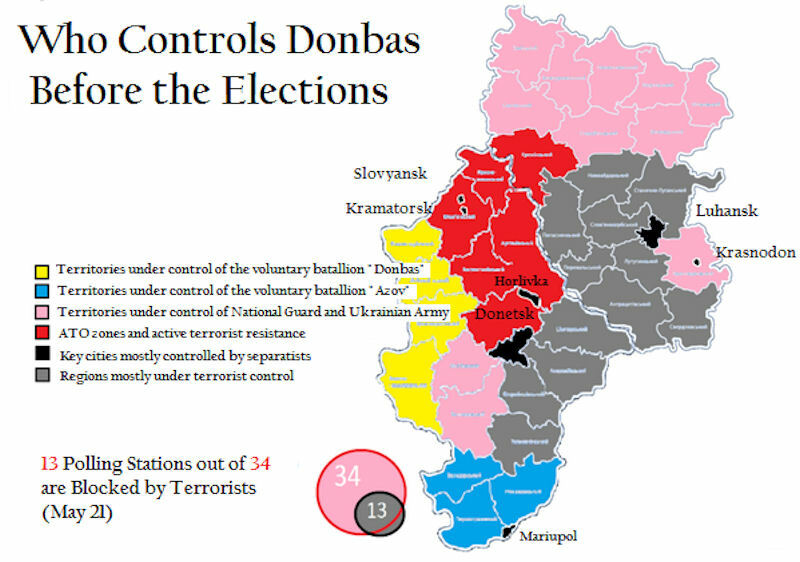 Lawmakers in Kyiv passed legislation 16 September 2014 granting three years of self-rule to the Russian-speaking eastern regions of Donetsk and Luhansk. That bill also backs local elections there in November. A separate bill grants amnesty to separatists who have not committed war crimes. The new law allows for the use of Russian as an official language, funds new development projects in Luhansk and Donetsk and gives the region the right to former their own police forces, also grants limited amnesty to those who participated in the conflict. Russia's Foreign Ministry on 17 September 2014 called the law granting temporary self-rule to rebel-controlled areas in eastern Ukraine "a step in the right direction." It warned that any attempts by "known political groups in Ukraine" to fundamentally change or revoke the measure would lead to renewed confrontation and undermine peace efforts. The law also calls for local elections to be held in the rebel-controlled areas on December 7. Ukrainian Prime Minister Arseniy Yatsenyuk told a Cabinet meeting that the government would allocate money for that vote only if it is open and transparent, and does not, in his words, "legalize the terrorists" - meaning the pro-Russian separatists and their self-declared Donetsk and Luhansk "people's republics." Yatsenyuk also said that while the law on self-rule would allow rebel-controlled areas to set up their own police forces, they will have to operate under Ukrainian law and the jurisdiction of the central government. Officials of the Donetsk People's Republic said they would neither hold the local elections called by Kyiv nor participate in national parliamentary elections set for October 26. The project -- to combine breakaway regions of Ukraine into an independent, pro-Russian state known as New Russia, or Novorossia -- appeared to breathe its last with an announcement by a top separatist official. Oleg Tsarev, speaker of what separatists call the joint parliament of the self-declared Donetsk and Luhansk "people's republics," announced on 20 May 2015 that the activity of all Novorossia structures had been "frozen" in apparent compliance with the Minsk peace accord aimed at ending hostilities in eastern Ukraine.